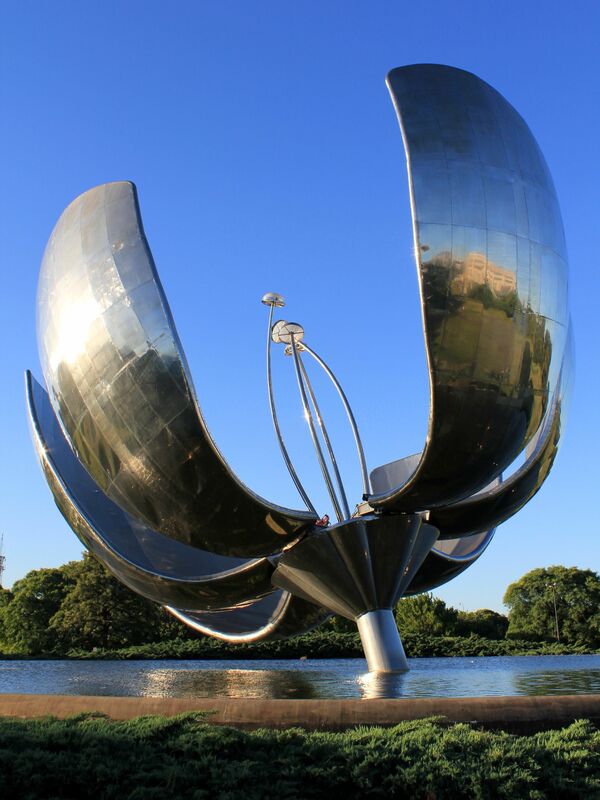 The monumental La Flor, a symbol of nature in the middle of the lake in Buenos Aires’s "United Nations Flower Park" next to Recoleta. United Nations Flower Park: Nature is back! This “green space” of an area of about 4.4 hectares received the name of “United Nations Plaza” in 1956. It is a tribute to this international organization, especially for its achievements in the area of humanitarian actions and in general human rights….. The park is situated next to the Faculty of Law of the University of Buenos Aires and to the Museum of Beaux Arts (Museo des Bellas Artes). 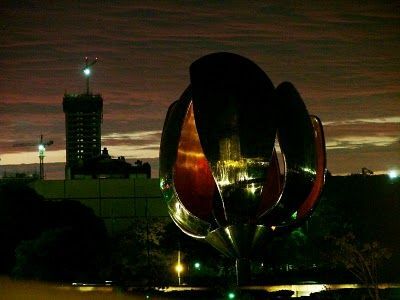 In the year 2000, an Argentinean architect Eduardo Catalano donated the gigantic flower called “Floraris Genérica” to the city of Buenos Aires. Well, not that often dreams are materializing, becoming the real parts of our lives as it was the case of La Flor. The sculpture was inaugurated at the United Nations Plaza on April 13, 2002. The massive yet elegant structure is located in the waters of the artificial lake in the center of the park. It is made from the stainless steel and aluminum, weights 18 tons and is 20 meters tall when open. It is a first Buenos Aires moving structure continuously controlled by a hydraulic system and photovoltaic cells. All six petals open at dawn and close at dusk following the movements of real flowers throughout the day. During evenings, the halogen projectors installed in flower’s filaments illuminate the internal surface of petals in a changing palette of rose colors giving even more life to this already “living” structure. On special days - May 25th, September 21st, December 24th and 31st they remain open all day long. Standing next to “La Flor” for long minutes it came to my mind that Eduardo Catalano achieved much more than just pushing through his dream. In my humble opinion, he (and all those from the city of Buenos Aires standing behind this project) proved that the process of the “Wild Urbanization” lasting already for centuries may have its end. The time when concrete and asphalt indiscriminately invades the nature is over. Tribute to the city of Buenos Aires by Eduardo Catalano (Inscription plaque installed in the park). Gigantic "La Flor" - called “Floraris Genérica”. “La Flor” marks the beginning of the new era, symbolized by this gigantic "living" structure. It is the time when the nature starts coming back into cities, not only in form of parks, or in pots of flowers dotting countless balconies, but also as gardens reclaiming the “wasted-land” of roofs…..
And may be the most important, the nature reclaims its well deserved place in our consciousness… That may be the most important aspect of changes symbolized by La Flor. You may not know yet, but the Capital Federal of Argentina - Ciudad de Buenos Aires is a green city. Parks, green acres, trees lining up along the streets and the countless "suspended gardens" forming on balconies sort of private oasis so cherished by city dwellers.... This is Buenos and if you are already here then you are definitely in the right place :-).